Slow Cooker Filipino Adobo Pulled Pork has all the traditional Adobo flavors and if you want a low-carb option just eat this tasty pork over cauliflower rice! 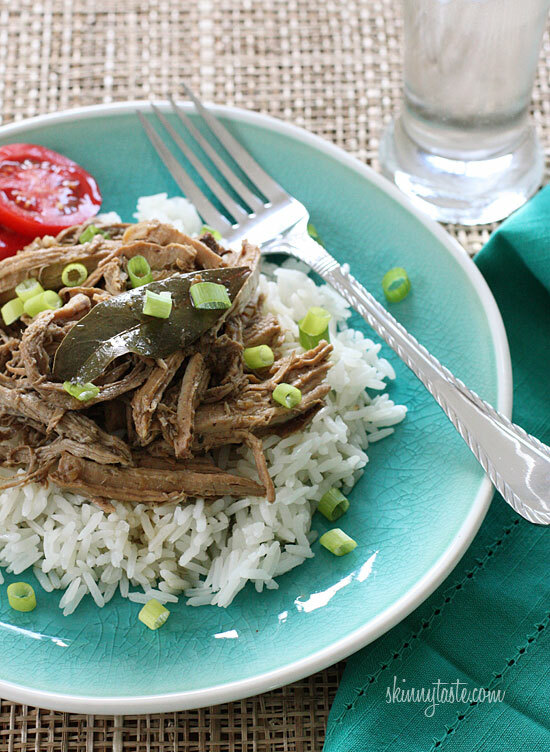 For Friday Favorites we feature past recipes you may have missed, and this Slow Cooker Filipino Adobo Pulled Pork from Skinnytaste sounds delicious. I’d love this over cauliflower rice with lots of extra green onions for me, please! In the Phillipines, the national dish is Chicken or Pork Adobo, and this Slow Cooker Filipino Pulled Pork has all the flavors of soy sauce, vinegar, garlic, and bay leaves that Adobo dishes are famous for. Gina served this over rice, but I think it would also be delicious wrapped inside a tortilla or piled on to a bun, or eat the meat in lettuce wraps or over cauliflower rice for a low-carb option! Get the complete recipe for Slow Cooker Filipino Pulled Pork from Skinnytaste. Check the Index Page for Pork to see all the slow cooker or pressure cooker pork recipes featured on this site. I am crazy about the adobo flavors, and even though I don't eat pork, I will try this with chicken. Yum, yum. Lydia, I had the thought of making it with boneless chicken thighs. I think it would be wonderful.